Dr. Angel Cabrera had an assignment at hand when the Mason Board of Visitors tasked him with creating a new vision for the university. 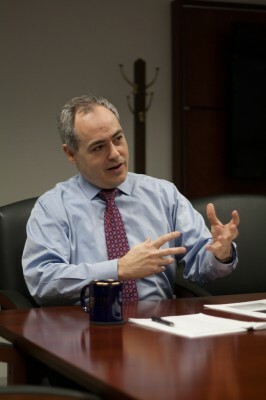 In only nine months on the job, the time it takes to complete one academic year, President Cabrera was expected to not only become familiar with and understand the largest university in the state, but to redesign its role in the future of higher education for the state, country and world. With the help and input from people from around the Mason community, Cabrera has completed a first draft and is now calling for edits. “The emphasis has been on bringing in as many voices as possible. We think, in fact, this is a conservative estimate, that we had about 3,000 people involved in the process,” Cabrera said. Those voices, made up of students, faculty staff and the local community were heard at town hall meetings, focus groups and online forums over the course of last semester. On Feb. 6, a working draft of this vision was released on vision.gmu.edu in PDF format for review. Much of the language is indeed familiar, including popular Mason buzzwords like diversity, innovation and entrepreneurialism. As a young and growing university, the mission defines and justifies Mason as a public, comprehensive research university committed to creating a more just, free and prosperous world. To personify the goals and values of the vision, the characteristics of the ideal Mason graduate are outlined as a student who is a respectful and ethical engaged citizen, a well rounded scholar who thinks critically and professionally and is prepared to work hard both at their job and in the community at large. The commitments that will foster the greatest change came largely from the working groups held during the fall. Primarily, they cover a dedication to identifying ways to better Mason education and securing a sound future through fundraising and a relationship with private and public organizations. Once the university-wide decision is finalized, each school and college will have to interpret how they can best interpret the model for their own growth and improvement. A dedication to innovative learning will come with support from both the top-down and an initiative from the bottom up to improve the work environment and attract more talented faculty members. To fund the projects that will spawn out of the vision, the university realizes that more philanthropic and outside revenue sources will be needed, especially as the state reduces support and tuition rates remain low. Once accepted by the B.O.V., the draft will be sent to Richmond for final approval. The new vision comes at a convenient time and will line up with the six year strategic plan that state universities operate on. The newest strategic plan will focus on how to accomplish the goals put forth by the vision and will be developing the 2013-14 school year. Cabrera hopes that the framework established by the vision will help the university make quicker decisions down the line based on their already established values. The vision can be viewed online at the following link: http://bit.ly/YoGV82.